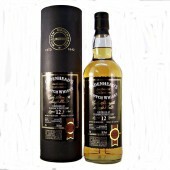 Teaninich whisky distillery is located in the northern Highlands whisky region. Close to the Dalmore distillery in the coastal village of Alness. 20 miles north of Inverness along the A9. The Teaninich (tee-ni-nick) distillery malt whisky output mainly goes for blending in Johnnie Walker blends. Distillery editions are rare and discontinued. Captain Hugh Munro in 1817, owner of the Teaninich Estate, establishes the distillery in the small village of Alness. A 30-minute drive, north of Inverness. The town is also home to the Dalmore Distillery. While the Dalmore distillery sits prominently on the shores of the Cromarty Firth. Teaninich is to be found hidden on the edge of town, in what is now an industrial estate. The Distillery passed to Lieutenant-General John Munro in 1845 he was a renowned benefactor of the local poor. Five years later Munro is posted on service to India, so leases the distillery to Robert Pattison to operate in his absence. The lease of the Teaninich distillery is passed on to John McGilchrist Ross in 1869. During Alfred Barnard’s visit of 1887 he describes it as the only distillery north of Inverness that is lit by electricity – ‘besides which it possesses telephonic communication with the Proprietor’s residence and the quarters of the Excise Officers’. John McGilchrist Ross relinquishes the distillery tenancy and is succeeded by the partnership of John Munro (whisky broker) and Robert Innes Cameron, (spirit merchant) both from Elgin in 1895. Three years later the Munro family transfers the whole of the distillery capital and all of its assets to the firm of Munro and Cameron. Robert Innes Cameron becomes sole proprietor of the Teaninich distillery in 1904. He also owns substantial interests in several Highland distillery companies, including Benrinnes, Linkwood and Tamdhu, and later became chairman of the Malt Distillers Association. The trustees of Robert Innes Cameron (1932) sell Teaninich to Scottish Malt Distillers Ltd in 1933. During the Second World War (1940-45) the distillery is closed as a result of wartime restrictions on the supply of barley to distilleries. In 1962 the stillhouse is refitted. The steam engine and the two water wheels are replaced in favour of electricity, two additional stills added, and internal heating by steam replaces the coal burning furnaces. Demand for Teaninich continues to grow, and a new stillhouse with another three pairs of stills added in 1970. The new still house is reffered to as the A Side. The older stillhouse as the B side. Further improvements are made in 1973 as the milling, mashing and fermentation part of the old distillery are rebuilt. With the great whisky lake of the 1980s the distillery is mothballed in 1985. Until 1991 when the Distillery re-opened by United Distillers & Vintners. now known as Diageo. First released as a Single Malt in 1992. A 10 year old under the Flora & Fauna Label. The older still house (B Side) is decommissioned in 1999. The following year the mash tun is replaced with a unique mash filtering system. During 2014 the 3 wash stills were modified into spirit stills. A new still house built to contain the 6 new wash stills. 8 new washbacks installed. Founded in 1817 by Captain Hugh Munro. Location; Highlands region, Northern district. 16 washbacks. Fermentation time 75 Hours. Matured in American oak bourbon and European sherry casks. The vast majority of Teaninich malt whisky production goes towards Johnnie Walker blends. Flora & Fauna 10 year old. Rare Malts Selection 23 year old (4 editions), 27 year old. Managers Choice 1996 Single Cask.